Taken from Zeltros at the age of 3, Drake Rylan lives his life as the commander of the Order of Tython and as a Watchman for the Mon Calamari people. He is a man of uncanny mechanical skill, practical not only in the repair and construction of electronics and machines but also in fixed structures and dwellings. For much of his training he served as a volunteer handyman for the aging Temple at Coruscant, commonly fixing routinely broken materials. A former student to the Great Jedi Tabris Longuine, Rylan has asserted himself as a stable, reliable force of peace within the Galaxy and established a reputation based upon his undeniable grit and determination. 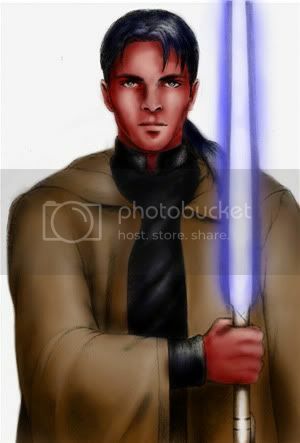 With the majority of his young life dominated by the guidance of the Order, Rylan was a disciplined and reserved child. Insatiable in his studies, Rylan frequented the Jedi Archives and buried himself in research. Respected by his peers, he was neither popular or unpopular. Practical and disciplined, Rylan defies the common stereotypes of the Zeltron people. Commonly he is coolly bleak in his assessment of situations and people. Bluntly honest, his constant sincerity defies the apparent secrecy of the Jedi Order. Rylan is a kind and modest young man who seldom socializes with other Jedi within the Order. He can most frequently be found training himself or servicing one of his ships with his familiar, battered tool belt. Possessing an indomitable Will and innate moral compass, Rylan has established for himself a reputation amongst all for his dogged investigations and tireless pursuit of objectives. He has, in many cases, simply exhausted those attempting to deny him his method and ground them down with his tireless resolve. Drake Rylan has set himself apart as a capable tactician and natural commander, establishing several distinct offensive maneuvers that have allowed him to overcome enemy fleets with inferior numbers and firepower. Innovative, adaptable, and aware of the moments as they come, Rylan has shown himself adept at making decisions in moments of strain or stress. His use of the fleet assigned to the Order of Tython during the Fourth Galactic Civil War earned him a reputation to be feared amongst Imperial fleet commanders. Constantly pressing himself to the limits of his abilities and beyond, tireless in his pursuit of his goals, Rylan is a tremendously powerful telekinetic. The great force of his ability to manifest and manipulate the Force is his most remarkable talent within the Force and has been adapted in many ways to augment his other, lesser known abilities. Once, in the midst of an exhausting battle with former Grand Master Robert Skywalker, Rylan successfully fragmented the blasted surface of Theeds and forced a seismic event to counter the legendary Skywalker's tremendous Force abilities. Drake Rylan has established through a shared love of mechanics and engineering a complex and tight bond with the Mon Calamari people. It is not unusual for him to be found conversing with his good friend, Bollog Thinsand, over the Holo. Rylan, unlike most Jedi, enjoys more amicable relations with the Hutts of Nar Shaddaa due to his perceived assistance with maintaining stability in the area in the course of his mission to rescue Amelia D'Centari from the Dark Side. In contrary to his generally well-received manner and notable friendships, Rylan is all but sneered at by the people of Zeltros. His stoic reserve and direct means of speech often comes as a snub to his origins, an insult to the locals that is not easily forgiven. A result of this has kept Rylan from returning home frequently, if at all. From a young age Rylan distinguished himself from other padawans in the dexterity and strength of his hands. This talent not only turned him into a remarkable mechanic and handyman but transferred into his swordsmanship. His first proficiency was established in Soresu, a discipline of swordsmanship that Rylan believed to echo his personal strengths closely. It was only with twenty-years of training and instruction that Rylan came to accept that within the maneuvers and intentions of Soresu he had limited himself. Taking the founding principles and techniques within Soresu, Rylan immersed himself in the Archives. His research lead for him to outline three distinct objectives that he wished exemplified within his swordsmanship. It was through the drafting of this Codex that Rylan first felt the summons of Jeet Thune-Do. Jeet Thune-Do style, or the Way of the Thune, calls upon Rylan to channel his inner stoicism to assertively command the pace and position of the conflict. It is through careful probing strikes that he sets the path and cadence of the conflict. The maneuver's signature lightsaber strikes are almost entirely two-handed, powerful and swift blows meant to quickly end the engagement. Most particular, however, remains Thune-Do's preference to fighting in close, confined quarters. Designed to control not only the path and cadence of combat but to contain the damage within a tight space, Jeet Thune-Do calls for Rylan to frequently exist within arm's length of his opponent. It became necessary, as a result, for Rylan to develop a powerful assortment of alternative maneuvers. Jeet Thune-Do involves an entire series of maneuvers and attacks with the hands and body, particularly its powerful assortment of throws and trips. It's hip-tosses were specially designed by Rylan with a lightsaber in mind, complicating their execution, but further adding signature elements to this evolving style of combat. Rylan has come to invoke it strictly in recent conflicts, both in his brief duel with Celia Zatel within the narrow hallway of Darth Imogen's cell block and against the Mandalorian Commandos dispatched by Zatel and Imogen within the building's stairwell. It was in the stairwell that he used one of Jeet Thune-Do's powerful trips, successfully knocking a Mandalorian over a railing and down two flights of stairs. As his personal code insists, Rylan was able to spare the Mandalorians despite fighting them in close proximity with his lightsaber. - Leads the Order of Tython in a full-scale assault on the planet Thyferra. The Imperial Moff surrenders the planet, liberating the Bacta-Rich world once again. Sylvia Arc sees her first action as a pilot under Rylan's guidance. - A Covert Unit of The Order of Tython, lead by Rylan himself, storms Corellia's Transit Authority and downloads a full log of its mainframe. A blast detonated by Rylan to cover their retreat accidentally detonates an N5 ordinance droid carrying confiscated explosives and weaponry. The resulting explosion kills hundreds of innocents. Sylvia Arc, while assisting, manages to keep a group of men from being crushed by falling debris using the Force alone. - Meets with Maxun Orion and initiates him into the Order of Tython. Drake Rylan constructed his first lightsaber to replace his oft-maligned training saber after Darth Tremor destroyed it in their encounter. Upon traveling to Dantooine with the intention of investigating the Enclave ruins Drake was introduced to Darth Imogen, whom confronted him within the fields surrounding the Enclave. Upon receiving her permission to roam the planet for answers, so long as he returned when he found them, Rylan felt himself drawn to a cave system a few miles away. Once within the Cave he discovered the crystal formations in its bowels, and after a harried encounter with the Kinrath that called the chamber home, emerged with a Pontite Crystal in hand. The crystal was unique in that the memory of a fallen female Jedi spoke to him through it. After attempting to contact her, or awaken some spectre from the stone to no avail, Rylan unwittingly bonded with the Pontite fragment before arriving on Tatooine. Scrounging for the parts necessary to build his lightsaber, Rylan was forced to sell his shuttle when its motivator failed. Trapped on the planet, and struggling with the unhappiness so easily felt within Mos Eisley, Rylan travelled to Mos Espa in an attempt to track down a freighter willing to help him get closer toward home. Along the way Sand Raiders destroyed his speeder and forced him to take shelter in a cave. In the middle of the night the Sand Raiders attacked the cave, forcing him to incapacitate them. On the body of one he found a necklace holding a battered, unpolished Durindfire Crystal shard. Meditating over the crystals, and stranded on Tatooine, Rylan met and forged a tumultuous bond with a young Zeltron named Niamh Cathey. Having fallen to the Dark Side, Niamh manifested as the most substantial seduction the Dark Side had offered. In defeating the temptation to fall, Rylan forged a powerful but tumultuous connection with the budding Sith and secretly gifted to her the remaining fragment of the Durindfire Crystal he had found for her lightsaber. The twin crystals would further strengthen the connection between the pair. Departing Tatooine, and Niamh under nebulous circumstances, Rylan booked passage to Coruscant. His passage to Coruscant was long and arduous, costing him much of the credits his ship had fetched him. Rylan used the time meditating over his crystals and arranging the components to his lightsaber before officially assembling it three days before his arrival in Coruscant. It's blade was to become his trademark silvered-blue. After his first lightsaber was destroyed on Naboo in a duel with Robert Skywalker, Drake Rylan went into a temporary exile in deep space while constructing his new one. After breaking up a shipment of Phriik alloy meant for the Empire on a tip from the Hutt family, Rylan used some of the metal for the housing of his new lightsaber hilt. This would become a symbol of his growth, as shortly after its completion he was ascended to Jedi Knight by Tabris Longuine and proclaimed Sword of the Jedi.